What is bird's nest behavior? Bird's nest behavior refers to when a user rapidly shakes their mouse around, leaving a jumbled mouse trail that, in session replays, resembles a bird’s nest - and denotes frustration or confusion. Bird’s nest behaviors are the digital equivalent of a frustrated customer not being able to find what they want in-store. Only if you’re lucky – or if they really desire it – will they be patient and continue with the purchase. Why is bird's nest behavior important? Bird’s nest behaviors are key indicators of user frustration and confusion. Digital teams should keep track of them and, like with multi-click behaviors, ultimately aim to eradicate them from their websites and apps. On a major ecommerce website, our data scientists looked at just under one million user journeys that corresponded to the site’s 5-step conversion funnel. We found that the average user completes 1.96 funnel steps per session - in line with the conversion rate we'd expect from an ecommerce store – while users who exhibited bird’s nest behavior completed an average of just under 1. In other words, while on average users would at least add items to basket, those who demonstrated their frustration with a bird’s nest behavior did not get beyond the browsing stage before bouncing. 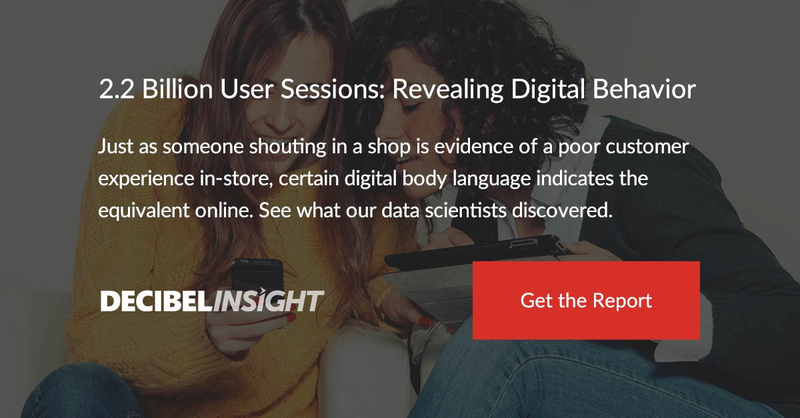 To learn more about bird's nest behavior - and other digital behaviors that denote user sentiment - download our full report on digital body language below.